Naked Cow Smoked Jerky is made from grass fed beef, No Sugar, No MSG, No Nitrites. 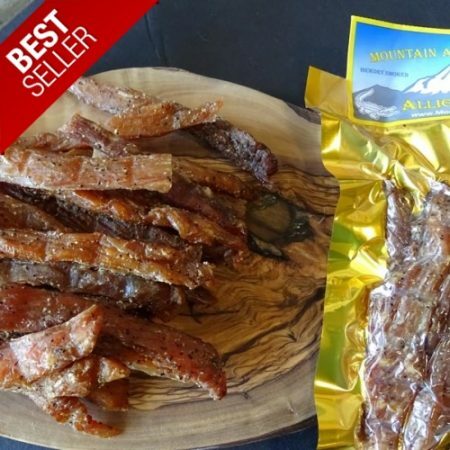 This jerky is minimally processed and is sugar free, soy free and gluten free. Heat level Mild. Flavor – lightly smoked, salt, black pepper and garlic. Naked Cow Smoked jerky is made from grass fed beef, sugar free, soy free, gluten free, no MSG, no nitrites. 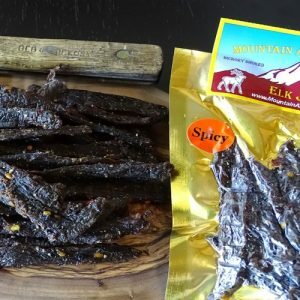 Mt America Spicy Elk Jerky is a gourmet jerky, handmade in small batches every day, this jerky is always fresh! Elk is always a best seller! Elk is lean, yet tender. It is raised free range and is free of added hormones or antibiotics. Flavor – a hickory smoked jerky seasoned with a three pepper combo (black pepper, red pepper, cayenne pepper). Medium spicy. 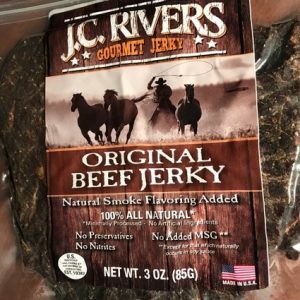 JC Rivers Original Beef Jerky is a small batch jerky handmade from thin slab cuts of top round. These large slabs are easy to tear and chew. Flavor – a hickory flavored beef with a touch of salt and pepper. 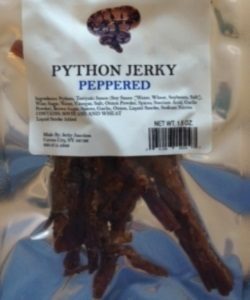 Python Jerky is one of our more exotic jerky animals. The flavor is similar to alligator. Flavor – a teriyaki flavor with hickory smoke and mild pepper. Meat cut – Medium-thick strips, somewhat moist. 1.5 ounce resealable bag. This is a seasonal meat and subject to availability. Mt America Original Beef Jerky is a gourmet jerky, handmade in small batches every day, this jerky is always fresh! Flavor – a hickory smoked jerky with a touch of salt and pepper.